An aerial view of Laurel Park, sight of official take-off and check-in. Dozens of islands sprinkle the main lake. Some large, some small. There are countless boat docks, too, most of which hold fish throughout the year — including largemouth and spotted bass. However, since the introduction of blueback herring, the number and size of Lanier’s spots is ever increasing. 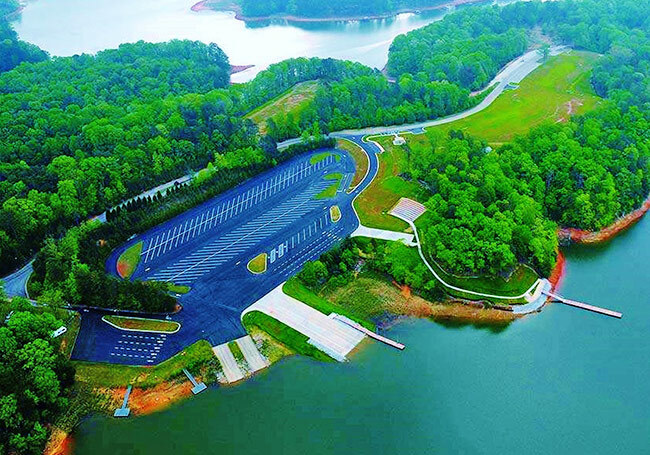 It had been years since I last visited Lanier, and I was looking forward to the week ahead. The first day of practice was cold and rainy. I started shallow, thinking the low pressure and dark skies might put some quality fish on the bank. However, with 47 degree water, that wasn’t the case … at least not where I was fishing. After 10 hours of punishment and nothing to show for it, I trailered the boat and headed to the warmest meal I could find. Day 2, I moved to the upper part of the reservoir, into the Chestatee River. That’s when things improved dramatically. Working boat docks and laydowns in off-colored water, I managed to put together a decent, mixed bag of fish. My lure selection included a Rapala DT-6 crankbait in the Red Demon pattern, a herring pattern Shadow Rap deep-diving jerkbait, a Yamamoto Thin Senko rigged to a 1/8-ounce VMC DSH Shaky Head, and 1/2-ounce Craig Miller custom jig dressed with a Fat Baby Craw trailer. All of the soft-plastics were in variations of green. Here's the lure selection that performed best for me. (L-R) Custom 3/8-ounce jig tipped with Yamamoto Fat Baby Craw, Rapala DT-6 in Red Demon pattern, and 1/8-ounce VMC Shaky Head with Yamamoto 5" Thin Senko in green pumpkin. Most of my bites came in less than seven feet of water on flatter banks. That, combined with a warming trend, gave me renewed confidence. On Day 3, I returned to the main body of the lake to try some marinas — places that had proven productive years ago. Concentrating on the larger docks in the backs of coves, I managed numerous bites from each of them — all of which came on the bottom in 12 to 20 feet of water using the worm setup. Because of countless submerged cables securing the docks, I opted for 10-pound Sufix 832 braid with 8-pound Sufix Advance leader. By day’s end, I felt I had a solid game plan and couldn’t wait to get things started. Weighing my options, I decided to start on the commercial docks down the lake — then, if things didn’t pan out, leave with enough time to try the Chestatee in the afternoon. As it worked out, I never needed to make that move. Beginning on the first marina dock, I had three fish in the box by 8am. A few docks later, I was culling. It was fun, and the strikes were aggressive. I fished clean and believed I had made a good first-day showing. But, when I got to weigh-in, I quickly realized I had more work to do. I was by no means out of the race. My 12½ pounds was near the top-35 cut, and I felt like I had plenty to return to. But a change in the weather also changed my luck. Spotted bass are special fish, and Lake Lanier is loaded with them. When my boat number was called on day 2, I raced to the same marina where I started the day before, hoping to pick up where I left off. But after more than an hour of probing the first row of boat slips, it was clear things were different. I pulled the MotorGuide and moved to the next marina, hoping it would jumpstart my day. While trolling toward the back, I made a cast to a lone boat ramp and boated my first fish of the day — a 2 pound spot. Upon reaching my target dock, I resumed the normal skipping pattern — detailing each boat slip with the shaky rig. Another hour passed and I had nothing to show for it. Evidently — because the skies were so dark and the lake so slick — the fish moved higher in the water column. I could see them clearly on my Garmin LiveScope, but they just wouldn’t cooperate. Again, I pulled the trolling motor and moved to the next marina, praying this time would be different. But another hour was wasted. I told my Marshal it was time to head upriver and do some pitching and cranking. Thirty minutes later, we were well up the Chestatee, to the area I found in practice. Finally, I got my second bite. Unfortunately, when I set the hook, I launched a two pounder over the bow and back into the water. Shortly after, I boated a keeper spot. Then the action died. Having little time remaining, I moved to where the Chestatee merges with the Chattahoochee. There, I cranked shallow shoals with the DT-6. Before time ran out, I scratched out two more keepers. Back at the scales, with barely more than six pounds, I plummeted in the standings. Aggravated with myself, I trailered the boat, gathered my belongings, then headed south to Florida … all the way, reliving every step taken during the week.